Барааны дугаар Байхгүй. Categories: Adult and Young Adult Courses, CAMBRIDGE. 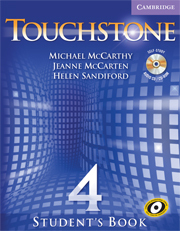 Touchstone is an innovative four-level series for adults and young adults, taking students from beginning to intermediate levels (CEFR: A1–B2). Based on research into the Cambridge English Corpus, Touchstone teaches English as it’s really used. Touchstone presents natural language in authentic contexts, and explicitly develops conversation strategies so learners speak with fluency and confidence.